The first hybrid electric car from Ford, the Mondeo HEV, has gone on sale in Ireland. The new Mondeo HEV is based on a four-door body style with a 2.0 litre 187PS automatic transmission petrol powertrain in either Titanium or Vignale series. The Titanium price-tag is €32,745, and includes a promotional launch discount and VRT rebate, but excludes dealer and related charges, plus terms and conditions apply. The price for the Mondeo HEV Vignale is from €35,280. Ciarán McMahon, managing director of Ford Ireland, says this first hybrid vehicle launch is an important step for the company. 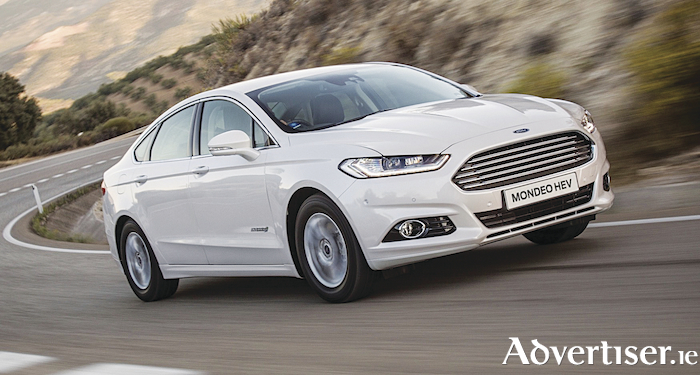 “With its legions of fans in Ireland, Mondeo is such a great model to offer with HEV capability. We are sure the Mondeo HEV will meet the needs of customers who are looking for a more environmentally-friendly car, but who do not want to compromise on space, driving dynamics, driving range and comfort. "Hybrid electric vehicles are the most popular of the electric models available as they neatly bridge the gap between traditional internal combustion engines and electric motors without the ‘range anxiety’ that some motorists feel in relation to ‘full electric’ vehicles. He says the arrival of the Mondeo HEV in Ireland is the first step in a progressive electric vehicle (EV ) development plan for Ford that will see 13 new full or partial EVs hit the streets of Europe and North America by 2020, including a hybrid version of the iconic Mustang that will deliver V8 power. Two electric motors are used in the hybrid system – one to support the petrol engine in driving the wheels and another to enable regenerative charging to the 1.4 kWh lithium-ion battery, located behind the rear seats. The Mondeo hybrid’s high voltage electric system is designed to working-life standards similar to Ford’s traditional combustion engines and transmissions. Ford says the Mondeo hybrid is capable of driving at up to 135km/h in electric mode, and the combination of a specially-developed 2.0-litre Atkinson cycle petrol engine and electric drivetrain gives Mondeo HEV excellent fuel efficiency with a claimed fuel consumption rate of 4.2 L/100km (or 67mpg ). For comparison purposes, a 2.0 litre diesel 150PS powershift automatic transmission would deliver a fuel consumption rate of 4.8L/100km (59mpg ). Ford points out that drivers can also use Ford’s Smartgauge interface to help monitor, manage and reduce fuel and energy consumption, with features including “brake coach” that encourages gradual braking to help return more energy to the battery. Ford Ireland says thanks in part to a significant VRT rebate, Mondeo HEV will have a transaction price of €32,745 for the Titanium model with a ‘walk up’ of a little over €2,500 to the top of the range fully loaded Vignale model. The Mondeo HEV Titanium vehicle spec includes: 16” alloy wheels; SYNC 3 with 8” touchscreen; keyless start and entry; sports seats; rain sensing windscreen wipers; traffic sign recognition; ambient lighting; high series instrument cluster display; parking sensors front and rear. Mondeo HEV Vignale vehicle spec includes: (additional to Titanium ) 18" alloy wheels, metallic paint, rear view camera, and adaptive LED daytime running lights.